Canadian money manager AGF Investments Inc. is sticking with U.S. fund manager F-Squared Investments even after F-Squared settled with the SEC for $35 million for false performance advertising. You have to read all the way to the end of the article to find out what F-squared is accused of doing: “According to the SEC, F-Squared falsely advertised a successful seven-year track record for the AlphaSector strategy which it claimed was based on real investments held for real clients. In fact, the data used in F-Squared's advertising was derived from backtesting. Furthermore, the hypothetical data contained a substantial calculation error that inflated the results of the backtesting, the SEC said.” Based on this standard, I’m proud to announce that my new strategy of owning Apple stock since April 2003 has given my hypothetical investors a stunning 60-fold increase on their money. Preet Banerjee has a video explaining the First-time Donor’s Super Credit (FDSC) for charitable donations. Big Cajun Man reports inflation figures each month, and this makes me reflect on how I see inflation differently from how I saw it in the past. Like most people, I used to think that inflation means the things I buy are becoming more expensive. However, if we think of the things we buy as having constant value, then what is happening is that dollars are becoming less valuable. Thinking this way is important for investors so they see their returns in real (after inflation) terms. For example, few people who think this way would see the logic of buying an annuity that pays out a constant number of dollars each month for decades. Why would you want payments that are worth progressively less each month? My Own Advisor has a financial blogosphere version of ’Twas the Night Before Christmas. Million Dollar Journey has Frugal Trader’s latest net worth update that nicely illustrates the kinds of life changes that are possible when you have substantial savings. The Blunt Bean Counter has a checklist for your year-end financial cleanup. One interesting suggestion to make things easier is to get your health care providers like physiotherapists and such to give you a year-end summary of all your spending. I haven’t listed my personal financial goals before mainly because the more interesting ones tend to be fuzzy. But I’ll take a stab at it here. I have no debt right now and I’d like to keep it that way. There can be good reasons to take on debt, but they don’t apply to me at my current stage of life. We don’t really use a budget, but we do look back at how much we’ve spent on everything. We add a monthly charge for very infrequent costs such as a new car, new roof, new windows, new furnace, and new flooring. This charge applies every year whether we buy any of these items or not. With these costs charged every month, I don’t count the cost of a new car in the year we buy it (unless we pay more than planned for the car or we buy new cars more frequently than planned). The same applies to the other infrequently-purchased items. I have no RRSP room left now, and I intend to use all of the new room that comes in 2015. My wife and I have no TFSA room left right now, and we plan to use up the combined $11,000 of new room that we’ll get for 2015. This is where things start to get fuzzy. I’ve had components of my income that are variable for many years now. I have some control over them, but not much. If my company has a good year financially, I get more money. If not, I get less. With my more precise goals on the spending side, at least it means that whatever I get as variable income gets saved. Lots more fuzziness here. This one is potentially in conflict with goals 2 and 5. If a very interesting opportunity to do something fun comes up, I may take it and spend more than I intended for the year. This way of thinking can be dangerous for those who tend to spend beyond their means. However, with my family’s saving rate on take-home pay at roughly 70% for 2014, I’m not at risk of spending my way into poverty. I often tell people who set personal financial goals that they need to include a debt-related goal as I’ve done here. Perhaps I’ve missed an important goal as well. Please leave a comment if you have ideas for improving these goals. The story about some teenager making $72 million day-trading is now confirmed to have been made up. It would be interesting to know how many people believed this story when they first read it. I didn’t. I know it’s easy to use 20/20 hindsight to convince yourself you knew it all along, but I made a point of saying I didn’t believe this story when it first hit. Balancing the likelihood of a publication making such a big fact-checking mistake against the likelihood of some teenager crushing the markets in such an extreme way, I went with the publication screwing up as much more likely. Michael Lewis has some entertaining ideas for reforming Wall Street. Canadian Couch Potato explains that the real value of limit orders is protection from wild markets rather than price haggling. He also did a good job of explaining ECN fees. Big Cajun Man reports that the older you are the less likely you will follow through on your New Year’s resolutions. SquawkFox explains that she maintains a low-cost diversified portfolio and doesn’t really care about all the stock market gyrations in 2014. My Own Advisor says you need to save more than 10% of your income. This generated quite a stream of comments. Robb Engen at Boomer and Echo has pushed his estimate of when he’ll reach financial independence from age 40 to age 45. For his sake, I hope this estimate is more accurate. If every 5 years you have to push your estimate out another 5 years, the projection doesn’t look good. Few people believe they’re digging themselves a financial hole and making their lives worse while they’re in the middle of doing just that. Robert R. Brown’s book Wealthing Like Rabbits uses an engaging story-telling style to persuade readers to avoid the most common ways that they can set back their personal finances. The main areas Brown covers are homes, credit cards, lines of credit, vehicles, weddings, home renovations, vacations, and Christmas. The approach he takes is to paint a picture of two families in similar circumstances except that one made more expensive choices. An extended analogy between credit cards and smoking was particularly amusing. In the end, the more modest family’s disadvantages are minor but their advantages in greater freedom to make life choices are huge. This style is persuasive. Brown manages to slip in the usual information about RRSPs, TFSAs, etc., but this is all just secondary to the stories designed to persuade readers that a modest home and an inexpensive car are the pathway to a happy life. What few criticisms I have are relatively minor. They’re included in the comments on specific parts of the book that follow. “Behind a bunch of crap was an exercise bicycle that was both brand new and eight years old.” A perfect description. Maxing out RRSPs and TFSAs “would make for a world-class retirement ... and if you earn a 7-digit salary, live in a tent, and really like Kraft Dinner that’s the way to go. However, most of us have to choose one, the other, or possibly a combination of both.” Of course, it’s nowhere near this difficult to max out both, but the real message here is to help people who don’t max out both get over the guilt. What matters is how much you save, not how much room remains. We can’t let unused RRSP and TFSA room that keeps building up discourage us from saving money. Brown’s quote is likely more effective at reducing guilt than my explanation. This isn’t good logic. Suppose a saver has a marginal tax rate of 20%. So, saving $5000 in an RRSP will generate a $1000 tax refund that the saver likely needs. Why not just save only $4000 in a TFSA to free up that needed $1000 right now? It may seem like the young saver is saving less money in this case, but this isn’t true. Future taxes when the money comes out of the RRSP will balance this out. If the saver’s marginal tax rate is higher than 20% in the future, then saving $4000 in the TFSA is actually better than saving $5000 in the RRSP and both still free up that same $1000 right now. Brown also prefers RRSPs over TFSAs because people are less likely to withdraw from RRSPs before retirement. This may be true, but his preference for RRSPs will have to stand on this argument and not the one about getting tax refunds. Like many books trying to persuade people to save, there is the obligatory example of saving some fixed amount of money each month and ending up with millions in 40 years. Of course, inflation will make these millions worth a lot less in 40 years than they would be worth right now. Brown does the same thing with examples of huge future interest costs on long-term mortgages. These little white lies are mostly harmless because they are intended to steer readers in the correct direction. Saving is a good idea and interest costs on mortgages are bad, even if this book overstates the case by ignoring inflation. “If you contribute $50 a week to your RRSP, you can reduce your taxes by $50 a week.” Not quite. You’re reducing your taxable income by $50 a week. How much your taxes are reduced depends on your marginal tax rate. This same slip occurred a second time a page later. How to invest your savings isn’t a main theme of this book, but Brown does say “you should invest in a low-cost index fund.” He goes on to explain the higher costs and general lack of greater performance from actively-managed funds. In a story of two brothers who each buy new homes, Brown hammers home the point that banks will lend you more than enough money to drown your finances. People have to figure out for themselves what their borrowing limit should be. “Leasing basically means that you rent the car.” I was prepared to disagree because I’ve heard people liken leasing to renting as a benefit because it’s a way to avoid the cost and hassle of actually owning a car. But Brown means it as a negative because you still end up not owning a car at the end of the lease. I’d say that leasing gives you the worst of owning and renting. Leasing resembles owning in the sense that you’re still on the hook for maintenance costs. But leasing resembles renting in the sense that you have nothing to show for all your payments when the lease is up. “Consumer Reports is a great place to find comparative data and objective information” on vehicles. Consumer Reports is certainly better than most publications when it comes to car information. But Phil Edmonston’s Lemon-Aid Guides that come out every year are an even better antidote to the barrage of car articles in newspapers, magazines, and online that are little more than extended advertisements. In adding up the expenses of driving versus flying to a sunny destination, Brown includes the cost of gas but neglects other car-related costs. This is a common mistake. In my own case, I found the total variable costs of driving (including fractions of maintenance, insurance, and initial purchase price) were about triple the cost of gas. So, in the book’s example, the $500 for gas jumps to about $1500. You may prefer to drive anyway, but at least you should do it knowing the real costs of driving. There can be good reasons for starting to save while still in debt. People need emergency savings. Some people need the feeling of making progress on savings at the same time as paying down debt. RRSP tax breaks for high-income earners are valuable even while you have a mortgage. I have no problem with those who choose to eliminate all debts aggressively before starting to save, but saving while still in debt can make sense too. However, Brown offers a strange additional reason to save while in debt: “the interest on your savings will be compounding for a much longer period of time than the interest on your debt will be, which makes the math favour the savings plan.” This isn’t true. If paying off debt gives a higher return than adding to savings one year, this advantage will carry forward indefinitely. The only thing I can think of that would work against this would be a behavioural issue where someone would just run their debts back up with foolish purchases. Given how hard it is for young people to build enough savings for a down payment on a house, Brown asks whether we should change the rules so that “first-time home buyers only need 10% down to buy their first homes without purchasing mortgage default insurance.” My answer is an emphatic no. Mortgage insurance costs should be driven by the actual risk of default and not some political goal. Some criticize personal finance books for asking “you to reduce the quality of your life today so that you can save for tomorrow.” Brown says this “is a great big load of crap.” He follows this with an excellent explanation of how your life will become better immediately if you get control of your finances. “Do not allow anyone to talk you into borrowing money to invest.” He goes on to say that borrowing to invest is “a worse idea as you approach retirement” and a “terrible idea during retirement.” This is good advice for almost all people. It reminds me of the story of a 75-year old widow who was talked into borrowing to invest. This book is mainly aimed at young adults. It uses an easy-to-read storytelling style that drives home important points about avoiding the biggest personal finance mistakes. I’m considering trying to persuade my own children to read it. We tend to look at investment returns one year at a time. Most investment models treat each year’s returns as independent of previous years. But this isn’t actually true. A decade of returns in the real world doesn’t look the same as 10 independent single years strung together. Here I look at 10- and 20-year returns of different stock/bond mixes based on historical data. As usual, it is easiest to get U.S. returns data. I found S&P 500 returns and 10-year Treasury bond returns from 1928 to 2013 at NYU Stern. I got historical CPI figures from Robert Shiller. This gave me 86 years of U.S. stock and bond real (inflation-adjusted) returns. From these returns I created 5 portfolios with different stock/bond mixes: 0/100, 25/75, 50/50, 75/25, and 100/0. With the mixed portfolios, I rebalanced to the target percentages once per year. Then I calculated rolling 10- and 20-year returns. For each period, I calculated the compounded average annual real return. Everything I’ve described so far is fairly standard, but the next bit isn’t. I took the 77 rolling 10-year annual returns and sorted them from lowest return to highest. I did the same for the 67 rolling 20-year periods. I did this independently for each of the 5 portfolio mixes. This allows us to compare the worst outcomes for each portfolio against each other. These worst cases for the 5 different stock/bond mixes didn’t necessarily occur during the same time periods. We can also compare the best outcomes and everything in between. Comparing the all stock portfolio to the all bond portfolio, it’s hard to see any reason to choose bonds. One might like the look of the 75% stock portfolio because in the bottom one-third of outcomes it looks better than the 100% stock portfolio, and isn’t too much worse for the top two-thirds of cases. It’s hard to see much justification for any of the portfolios with 50% or more bonds. In this case it’s hard to make a case for anything but the all-stock portfolio over a 20-year period. More than half the time stocks beat even the very best bond return. It’s interesting to note that there isn’t much difference in slopes among the portfolios. The slope roughly corresponds to volatility. We’re used to thinking that stocks are much more volatile than bonds, but this isn’t true for 20-year periods. The only remaining justifications I can see for having bond allocations for very long periods are related to behavioural problems and investing skill. By behavioural problems I mean that many people can’t stay invested in a volatile portfolio for 20 years without selling at a bad time. This is a real problem. I think people should try to educate themselves as much as possible to avoid such problems, but in the end, most people need bonds for a feeling of safety. The other justification is investing skill. An investor who believes he or she can pick above-average bonds or bond funds will have reason to own bonds over the long run. Of course, the vast majority of such confident people are wrong and will get worse results due to following their own ideas. But there will be some who get good results by luck and possibly some who have genuine skill. For the rational investor who is neither skittish nor overconfident, how should we use these results? I look at my own portfolio as made up of different investment horizons. I will spend some of my money the first year I retire. I’ll spend another slice the next year, and so on. Each slice of my portfolio needs a different allocation. Only by adding up all of these individual allocations do I obtain my overall portfolio split between stocks and fixed income. The result is a heavy overall allocation to stocks, even when I first enter retirement. Because I managed to stay invested through the 2000-2001 crash of the tech bubble and the 2008 financial crisis, I have some confidence that I won’t sell at a bad time in the future. So, I can reasonably focus on returns over 10 or 20 years rather than single-year returns. For investors who can stay calm through short-term fluctuations in stock prices, I still can’t see much justification in owning bonds in a portion of portfolios that they won’t touch for 10 or more years. In her book, Money Rules, Gail Vaz-Oxlade shows her very effective and unique style for helping people get out of debt and handle their money properly. We all know we should spend less than we make, but Vaz-Oxlade uses her keen insights into people’s thinking and habits to offer helpful strategies. This book is useful for those who need help with money and those looking to help others with their finances. I’ve already reviewed parts of the book related to life insurance and investing. These parts weren’t as good as the rest of the book that I review here. I always thought you couldn’t pledge RRSP assets as collateral, but you can. “If you borrow against your RRSP, the fair market value of the RRSP assets pledged are included in your income for tax purposes at the end of that year. When the plan’s assets are no longer pledged, you may deduct the amount previously included in your income, minus any loss resulting from using the plan’s assets as collateral.” It sounds like this could be abused for income smoothing. “A preapproved mortgage does not mean you’re guaranteed financing.” Lenders have outs. If you don’t name a contingent subscriber on the RESP you set up, and if you die intestate, “the plan will likely be terminated and all the contributions and income earned put into your estate.” So, money you intended to be for your kids’ education might not go to them. “Don’t let your lender decide how much home you should buy.” Banks will let you overextend yourself. “A consolidation loan does not pay off debt.” This is an interesting insight into the mind of someone who handles money poorly. I think of a mortgage as debt, but apparently some people don’t. “Only people who are LAZY and can’t be bothered think a budget is a waste of time.” I don’t think they’re a waste of time for most people, but I don’t think I need one for my money personality. But I suspect that still puts me in the “LAZY” camp. Maybe “you make a whack of cash and you live the simple life, but that is no reason not to have a budget.” Now it feels like she’s writing about me. In my defense, I do know how much I spend in an average month, but I don’t have a budget. “If you think you can do better without a budget ... pass this book to someone who is smarter than you.” Now it’s starting to feel personal, but at least it’s funny. I’m still not going to create a budget, but I appreciate that budgeting is a critical tool for many people to get out of debt and stay that way. No doubt most people who think they don’t need a budget are wrong. Who knows – maybe I’m one of them. We even have a section for believers in debt. “Are you in debt and tithing or giving money to charity? That’s not your money to give, so stop.” Young people who get talked into giving $25 a month to some charity should heed this advice. The idea here is that each of us has a cash level or “money set point” where we feel normal. For me, it’s about $5000 in a chequing account. But others have set points at $1000, zero, or even $2000 into overdraft. Vaz-Oxlade recommends taking a spending holiday where you cut way back on spending to pull yourself out of overdraft and build up a cash buffer. But if you can’t change your mental money set point to a higher level of cash, she suggests splitting your money across multiple savings accounts. That way no one account has enough to make you feel rich and in a mood to spend. “We should encourage small retailers to discount for cash. ... I want to see a flurry of signs in stores: ‘We give a 1% discount for cash purchases.’ If retailers don’t twig to this, then they’ve got to stop whining about how much credit card fees are costing them. They can’t expect consumers to switch to cash with no incentive.” I’d love to see more discounting for cash payments. I can’t imagine what my life would be like if my wife handled money poorly, but many people have a “money moron” spouse. Vaz-Oxlade gives a set of concrete steps you can take to isolate your finances from a partner who is irresponsible with money. The problems with collateral mortgages can get quite technical. Vaz-Oxlade gives the best explanation I’ve seen of the problems with this type of mortgage. Few mortgagors have any idea of what type of mortgage they have. Overall, this is a very wide-ranging book on many different aspects of personal finance. It contains a lot of solid advice. The best parts are where the author demonstrates her skill at helping people change their habits to get out of debt and generally handle their day-to-day finances better. Not so good were the parts related to investing. What I got out of it was better insight into the minds of those who handle their finances poorly. Which Group RRSP Costs are Worth Paying? Barry Ritholtz says the “All-weather portfolio” from Anthony Robbins is based on the peculiarities of investment returns over the last few decades. Ritholtz believes his portfolio would be better over the next 20 years and offers Robbins a $100,000 bet based on whose portfolio gets higher returns. I have to agree with Ritholtz. The all-weather portfolio is very heavy in bonds, gold, and other commodities. It’s a very backward looking portfolio. Ralph Nader explains why he doesn’t have a credit card. This thoughtful piece takes a 1000-foot view and puts the problems with credit cards into perspective. Canadian Couch Potato explains why three funds following the MSCI EAFE index show very different returns. Tom Bradley gives his take on the coming new mutual fund disclosure rules known as CRM2. It should be interesting to see what will happen when investors start seeing how much they pay for investment advice. Justin Bender says that the benefits of Dividend Re-Investment Plans (DRIPs) is mostly a myth. There may be behavioural advantages from not letting cash accumulate and tempt people to spend, but there isn’t much difference between DRIPing and periodically investing cash. Personally, I treat accumulating cash as part of my emergency savings that I’d have anyway. Jason Zweig explains very clearly how some professional money managers use different forms of “window dressing” to make their performance look better than it really is. Robb Engen at Boomer and Echo has decided to switch from dividend investing to indexing. Among his reasons is his understanding of behavioural biases. Mr. Money Mustache does a case study of a two-income family trapped in a high-cost life with full-time jobs they don’t want. I didn’t think the obvious improvements that occurred to me would make a big impact, but Mr. Money Mustache showed how to transform their lives. Preet Banerjee starts up his podcasting again with an interview with Frank Wiginton who specializes in educating employees of various companies about finances and investing. SquawkFox says impulse buying is the Achilles heel of saving money. She has a prescription for recognizing your weaknesses and dealing with them. My Own Advisor gave a dividend income update that included the following quote: “Part of being an investor is making sure you do what you can to stay out of your own way.” This is so true, but I only understand it now looking back on past mistakes. I wasn’t at all aware that I was getting in my own way while I made the mistakes. Potato (a.k.a. John Robertson) announced the official launch of his new financial book The Value of Simple. See my review here (but the associated draw is now over). Gail Vaz-Oxlade’s book Money Rules covers so many financial topics that I decided to start by reviewing just the parts related to investing here. The bulk of the book offers excellent advice to those who need help controlling their spending, but the advice about investing is weak. Mutual funds aren’t exactly known for clearly explaining their fees. MER has a precise definition about what costs are included and how it is disclosed. Without these rules, mutual funds could just classify all sorts of costs with names other than “fees” and then claim that their “fees” are very low. At least the few investors who’ve heard of MERs have a chance of understanding what fees they are paying. Vaz-Oxlade goes on to say that those who try to minimize MERs “don’t really understand what’s going on and are just blathering on because they enjoy the sound of their own voices.” She says trying to minimize MERs may or may not be the right choice. Obviously, the first mutual fund worked out better, but this logic reminds me of a quote often attributed to Will Rogers: “Buy some good stock and hold it till it goes up, then sell it. If it doesn’t go up, don’t buy it.” There’s an obvious temporal problem with needing to know if the stock will go up before you buy it. Vaz-Oxlade’s logic has a similar temporal problem. You can see past mutual fund returns, but not future returns. And she says herself that past performance is not a good predictor of future performance. So, we don’t know at the time we buy a fund what the future returns will be. Great past performance means little. We can’t invest in past returns; we can only get future returns. We’d like to think we can figure out which will be the good mutual funds, but we can’t. The best predictor of good future returns is a low MER. In another attempt to justify high MERs, she says “If you’re paying 20% in fees and earning a 40% return, you’re still up 20%. Did you really think a 20% return would come without a hefty price tag?” This perpetuates the myth that you get what you pay for in money managers. The truth is that active money managers as a group do not earn extra returns that exceed their fees. We’re used to the idea that you pay more for higher quality. A 2.5% MER mutual fund must be better than a 1.5% MER mutual fund, right? All the evidence says this isn’t true. Lower MERs are strongly correlated with higher returns. Vaz-Oxlade says she has an investment guy, Patrick, because “Hey, do I look like I have time to keep my eyes glued to the markets?” This perpetuates the myth that the main value of a financial advisor is to pick investments. This isn’t true. Any fool can buy some index funds and get better long-term returns than almost all investment professionals as long as the fool stays invested for the long term. The real value of a good financial advisor is providing tax planning, estate planning, helping you stick with an appropriate asset allocation, etc. Expensive mutual funds have an interest in making us believe that only they can navigate the rough seas of investing, but this is nonsense. Investing has risks and professionals can’t make these risks disappear. Financial advisors can’t consistently sniff out market declines in advance. The book divides investment horizons into three categories: less than 3 years, 3 to 10 years, and greater than 10 years. Only investors whose horizon is longer than 10 years are advised to buy stocks. Most commentators set a limit of 3 to 5 years, but a 10-year time horizon for stocks may be reasonable for conservative investors. 1. When stocks drop you might lose your nerve and sell locking in a big loss. 2. When stocks drop you might get a margin call forcing you to sell stocks at a steep loss. 3. The advisor talking you into using leverage has no intention of investing your money in inexpensive index funds that give returns that match the market. Rather the advisor intends to invest your money in expensive mutual funds that pay fat fees back to the advisor. These fat fees greatly increase the risk that a leveraged portfolio will perform worse than a non-leveraged portfolio. Vaz-Oxlade says that “mutual fund averages don’t mean diddly.” At first I thought she just meant that past returns aren’t a good predictor of future returns. But it turns out that she misunderstands how mutual funds report their returns. Add these up and divide by 5 and this “averages out to an annual return of 8.4%. That means on a $1000 investment, you should end up with $1,497.” She got this figure by compounding 8.4% for 5 years. She then goes on to apply the actual 5 returns to a $1000 initial investment and finds the final result is only $1438. Of course, the difference is due to the volatility of returns. Her explanation that the one negative year is to blame is a little off, but it’s close enough. After all, the bulk of the volatility in these 5 returns comes from the one negative return. The big problem with her complaint is that the mutual fund would not report its 5-year return as 8.4%. It would actually report 7.53%. This is because mutual funds must report compound returns. This means that if you start with $1000 and compound 7.53% for 5 years, you get the $1438 figure that Vaz-Oxlade calculated. “If a good fund has swallowed an underperforming fund, know that post-merger, hot funds tend to cool off.” The truth is that hot funds tend to cool off whether they’re involved in a merger or not. Instead of chasing star fund managers and trying to guess which funds will be hot, it’s far better to focus on low fees and a sensible asset allocation. Canadians mostly get the shaft when it comes to investing because of high mutual fund fees. Those who try to invest on their own often harm their returns even more by chasing performance (buying high and selling low). I believe Vaz-Oxlade genuinely wants to help her readers. It would be nice to see her steer her readers away from high-cost investing traps the same way she steers them away from bad spending habits. The internet is littered with debates over the merits of permanent life insurance and term life insurance. They both pay your beneficiary if you die. The main differences are that permanent life insurance costs more but has an investment component. Most debates are full of words, but the real answer to which is better is in the numbers. I looked at some numbers in an example from Gail Vaz-Oxlade and found her analysis to be seriously flawed. Term life insurance is fairly simple. You pay a monthly or yearly premium for 10 or 20 years, and if you die, your beneficiary gets the coverage amount. The size of the premium is based on the amount of coverage and how likely you are to die during the 10- or 20-year term. The younger and healthier you are, the less you pay. If you don’t die during the term, you have nothing to show for your premium payments. But, the premiums are lower than they are for permanent insurance. Permanent life insurance has a number of variants, but the main idea is that you get a savings component in addition to the life insurance component. Your beneficiary gets paid the coverage amount if you die, but you get to access the savings if you live. You can think of the premiums you pay as being split between the life insurance part and the savings part. For this reason, premiums for permanent insurance are higher than those for term life insurance. So, which type of life insurance is better? It all boils down to the numbers in the savings component. Some people might like the forced savings part of permanent insurance, and some people may benefit from tax considerations, but this just slightly shifts how good the savings component has to be to tip the scale to favour permanent insurance. When I was buying my own life insurance years ago, I looked at numbers from a life insurance salesperson and every permanent insurance scenario he described looked worse than term insurance after crunching the numbers. In fact, it wasn’t close. The first time I heard Gail Vaz-Oxlade speak positively about permanent insurance, I was surprised. But I’ve always respected both Gail’s genuine desire to help people and her skills at steering people to handle money better. So, I assumed she knew something I didn’t. I was shocked to see her ignore 35 years of inflation. Quite apart from the questionable choice of buying life insurance when you have no dependents who need it, how can we ignore the difference between the value of $90 in 1989 (when she was 30) versus the value of $90 in 2024 (when she will be 65)? Assuming inflation over the next decade of 2% per year, dollars in 2024 will buy less than half as much as they did in 1989. It isn’t fair to judge a permanent life insurance policy solely based on cashing it out at age 65, but that’s the measure we have here. I decided to repeat Vaz-Oxlade’s calculation taking proper account of inflation. In 2024 dollars, the total of the premiums works out to $53,154 rather than $37,800. This makes the total insurance cost $21,154. Coming back to 2014 dollars, this is $41.32 per month. This is a far cry from $13.81 a month. What if we assume that Vaz-Oxlade could have invested her money with a return of 2% above inflation over those 35 years? In this case, the future value (in 2024) of all her premiums is $78,927. The total insurance cost in 2014 dollars works out to $91.66 per month. You may wonder how this could be more than the $90 she pays each month. The answer is that her initial payments back in 1989 were considerably more valuable than $90 today. What if we consider a person who doesn’t handle money well and is mired in debt? In this case, the higher premiums for permanent insurance could have been invested at an even higher rate of return by paying off some debt. So, the calculated monthly life insurance cost would be even higher. In a later section of the same book, Vaz-Oxlade claims that permanent insurance is cheapest over your lifetime if you start young. As evidence, she adds up the monthly premiums for a $200,000 permanent life insurance policy starting at ages 25, 30, 35, and 40. 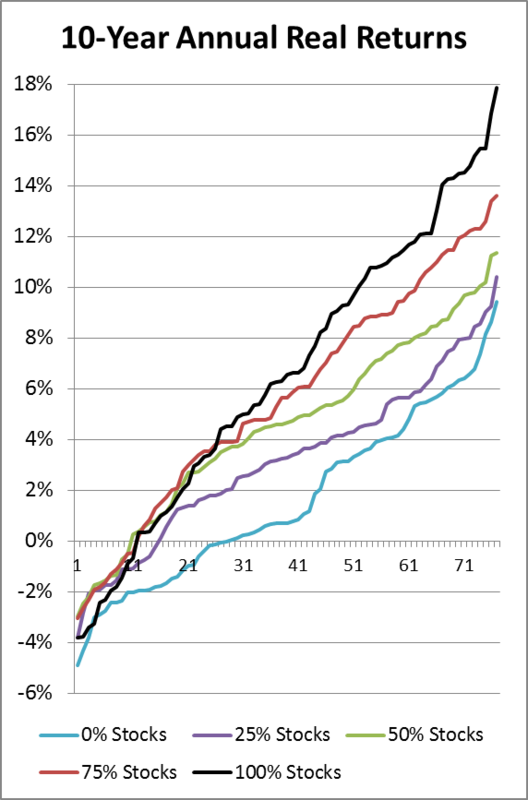 The total premiums paid to age 65 turn out to be lowest if you start at age 25, but only because she ignores inflation. Factoring in inflation, total costs are highest when you start young. This doesn’t mean you should necessarily wait until you’re older to get life insurance, though. If your family depends on your income, you need life insurance. I don’t claim to have a definitive answer to which type of insurance you should buy. But I can say that I still haven’t seen an example where permanent insurance looked like a better deal than term insurance. When comparing term and permanent life insurance, be sure to account for inflation, returns you expect on your savings, and your need for forced savings. Many companies offer their employees a group RRSP rather than a defined-benefit pension plan. The main attraction of a group RRSP is that the employer often matches employee contributions with an additional 50 cents to a dollar on each employee dollar. Such plans have embedded costs as well. Here I look at my own plan’s costs to examine which are providing value and which are not. Employees: Those who save money and invest it in their personal accounts within the group RRSP. Employer: Main functions are to hire a benefit services expert and match employee contributions (with an extra 50 cents on the dollar in my case). Benefit Services Expert: Hired by the employer to help choose a group RRSP provider and set up the plan to suit the employer’s needs. Also performs ongoing negotiations with the group RRSP provider to make changes such as lowering fees or changing the available investments within the plan. Group RRSP Provider: Typically an insurance company that does most of the administrative work of handling employee accounts, collecting contributions, issuing tax receipts, etc. Also works with institutional money managers to create a set of available investments for employees to choose from. Institutional Money Managers: Similar to mutual funds, these money managers take grouped assets within the plan and invest it in stocks, bonds, real estate, etc. The funds may be actively managed or passively managed (index funds). In the case of my group RRSP, only one fund is a passively-managed index fund. The benefit services expert, group RRSP provider, and money managers get paid. In my case, I’ve been told that my employer pays the benefit services expert and also pays certain administrative costs from the group RRSP provider. The remaining group RRSP provider costs and institutional money manager costs come out of employee savings. That’s the way you need to think about these costs. The helpers who make the plan work earn a living by dipping into the savings in your account. The all-in cost borne by employees varies by fund. In the case of my group RRSP, after adding in HST and not counting trading expenses within each fund, the fund costs range from 1.45% to 2.11% per year. Even the recently reduced cost of the one Canadian stock index fund is still 1.50% per year. I tried to find out how these costs were split between the group RRSP provider and the institutional money managers. Our benefit services expert was very reluctant to put a number on this, but finally estimated that only about 30% of costs went to the group RRSP provider. If true, this means that we pay over 1% of our savings every year to institutional money managers. But institutional money managers are the least valuable part of the entire group RRSP. Active picking of stocks and bonds is a zero-sum game. This means that, on average, institutional money managers add no value. In fact, once you factor in the higher trading costs, they subtract value. You might think that you’ll only pick the good money managers. But which are these? Poorly-performing funds are routinely closed. Funds with good past performance routinely give mediocre results in the future. Odds are the funds you pick will be just average and their returns will lag index returns by the amount of fees charged. The employees would be better served by replacing all actively managed funds with index funds and passing the savings on to employees. It’s bewildering that the one index fund offered in my plan has its fees set so high. This fund’s managers get paid the same as active stock pickers, but they just let a computer make all the decisions. If the fund choices were all index funds, the costs to employees would be just the rock-bottom index fund costs plus the group RRSP provider’s administrative costs. As assets in the plan grow, these administrative costs would become a progressively lower percentage of employee savings. There is a big barrier to moving to index funds. The benefit services expert touts the access to institutional money managers as second biggest advantage of my group RRSP after employer matching of employee contributions. Some of these money managers only accept clients with large investments such as $250,000. Even this could be overcome if it weren’t for the fact that this pitch was so effective. Most employees seem sold on the idea that these star money managers offer real value. Maybe some employees even feel the supposed prestige of being allowed to invest alongside wealthy elites. In theory, the benefit services expert shouldn’t care whether the funds offered are active or passive as long as he is paid the same either way. But if employees are impressed by star money managers and a pitch based on index funds causes fewer employees to sign up for the group RRSP, the benefit services expert will have failed to achieve the employer’s goals. In theory, the group RRSP provider shouldn’t care whether the funds are active or passive as long as the provider gets paid the same either way. However, the group RRSP provider also serves as the institutional money manager for some of the funds offered in the group RRSP. So, the provider has an incentive to maintain fat fees. Offering both active and passive options would cause problems because employees would notice the glaring differences in fee levels. The likely explanation for the expensive index fund in my plan is that a very low fee would make the other choices look bad. The benefit services expert worked hard to compare our fees to typical mutual funds and declare that we were saving money. Huge fee differences among funds make it clear that much higher savings are possible. In the end the only way there would ever be a shift to low-cost index funds in my group RRSP is if someone convinces my employer to insist on this change. I’m not holding my breath. Jason Zweig puts the brutal 2014 performance of active fund managers into perspective. Dave Liggat gives “robo-advisor” Wealthsimple a try and gives us a thoughtful review. I wonder whether a simple app would ever be meaningful competition for such automated index investing services. You could certainly imagine all the automation of Wealthsimple or its competitors getting coded into an application that just tells you what trades to perform in every situation. The question then becomes how many people are bold enough to go with an automated index investing service but not so bold as to do the trading dictated by an inexpensive application. Preet Banerjee is finally back to blogging and points to a very funny video explaining quantitative easing. Scott Adams explains why your smart phone may be making you fat. The Blunt Bean Counter describes ways of avoiding OAS clawback ranging from simple income-splitting to complex strategies involving holding companies and trusts. Big Cajun Man has some suggestions for ways to put pay raises to good use. Some friends of mine get regular pay raises, but others haven’t seen a raise in years. My Own Advisor reviews and gives away copies of John Robertson’s new financial book The Value of Simple. Imagine you’re in a grocery store looking at apples. You like the look of them, note the price, and decide to grab 5 apples. But something strange happens. Right after you pick up the first apple, the price goes up. You get the first apple for the original price but have to pay more for the other 4. This is an analogy for the complaints against High-Frequency Traders (HFTs). In stock market trading there has always been an advantage for those who can react fastest to new information. It may seem that the criticisms of HFTs by Michael Lewis and others is just the usual moaning by losers about their inability to compete with winners. But there is more to it than this. Let’s get back to the grocery store and the apples. Remembering your first experience with the price of apples rising while you picked them up, you decide to just watch the price. You stand there for a long time and the price doesn’t move. The next day you watch the price of apples for a long time and again it doesn’t move. Finally, you reach out to scoop up 5 apples in one motion. But again the price jumps in the split-second between the first and second apple. What’s going on? You know prices go up and down once in a while. This is a part of life. But in this case, you are the cause of the price increase. There appear to be a whole basket of apples being offered for a certain price, but for some reason you can only get one at that price. At any point in time while stock markets are open, a certain number of Apple shares are offered for sale at a given price. Let’s use the example 5000 shares available for $119 each. You’d like to think you could get all 5000 shares at that price. However, many traders found that if they placed an order for all 5000 shares, they would get, say, the first 100 shares for $119, but the price would go up for the rest. It’s certainly possible to just have bad luck. With Apple trading so many shares second by second, it’s possible for someone else’s order to get in ahead of yours. But let’s look at this at computer speeds. A computer’s clock or “heartbeat” is about a billion times faster than a human heartbeat. One of our seconds is like decades to a computer. To us, a display of all trades of Apple shares would go by as a blur. But to a computer, these trades arrive days or months apart. At computer speeds, the time it takes for an order to get to a stock exchange is quite long. So, it’s not too unusual to place an order and then someone else’s order arrives first. But this still qualifies as somewhat of a coincidence. If it happens repeatedly, something strange must be going on. It’s not just bad luck that other orders are coming in first. Just placing an order for 5000 shares seems to be the cause of the competing orders. Just as reaching for 5 apples in the grocery store seemed to cause a price increase after the first apple, reaching for 5000 shares of Apple stock seems to cause the price to rise after the first 100 shares. To understand what is actually going on, we need to understand that there are multiple exchanges where stocks trade. So, the 5000 Apple shares available for $119 is actually a collection of smaller number s of shares available at different locations. When you order 5000 shares, your order gets split up into multiple orders from different exchanges. The multiple orders do not all get to the different exchanges at the same time. The time differences are imperceptible to people, but are like weeks to a computer. Critics of HFTs say that when one small order gets to one exchange, HFTs see it and then race to the other exchanges to buy Apple shares ahead of the other pieces of the split-up order so they can resell the shares at a slightly higher price. Some call this “electronic front-running.” Many exchanges actually cooperate with HFTs and take a slice of their profits. HFTs are accused of many things, but electronic front-running is the main criticism. The net effect is that if you’re an institutional investor who wants all 5000 shares available at $119, you can’t have them. Of course, it’s not that you’re somehow entitled to these shares. Someone else who acts first independently is allowed to get in there first. But it’s a different game when it’s your own order than causes most of the $119 shares to disappear. It’s normal for traders to have insight into each other’s actions. The question is how fine-grained this knowledge should be. If the market offers 5000 Apple shares at $119, it seems reasonable for traders to learn that you bought all 5000 shares. Then they devise strategies based on the possibility that you may try to buy more. But allowing HFTs to respond 100 shares at a time makes a mockery of the notion that there were 5000 shares available at $119. Big traders are used to what are known as “market impact costs.” If you’re trying to buy 100,000 shares of Apple, you should expect the price to rise before you’re done buying. But the question is whether market impact should kick in after the first 5000 shares in our example, or whether it should kick in after the first 100 shares. Applied to our example here, Kovac essentially argues that big traders should expect some market impact if the first 100 shares of a much larger order get traded first at one exchange. This is certainly true given the way markets work now. The question we need to answer is whether we prefer to have a stock market where market impact costs wouldn’t kick in until after buying the first 5000 shares that were advertised as available across all markets. No matter what speed limits we might try to place on the stock market, there will always be some traders who are faster than others. The fundamental question is whether we want a market where the fracturing into many sub-markets is a critical part of making money from trading or whether we want a market where the current overall quotation for a given stock has some meaning. Should individual investors be concerned about all of this? You can only lose money to HFTs when you trade. The dollar amounts at stake are very small on each trade. For buy-and-hold investors, this whole story is mostly a yawn. Even do-it-yourself investors who day-trade have more to worry about than losses to HFTs. The main concern is the effect of electronic front-running on institutional investors who trade big blocks of stock. So, if you own actively-managed mutual funds, HFTs may concern you. Back near the end of the high-tech boom, Gail Vaz-Oxlade wrote an investing book called Dead Cat Bounce. Following Gail’s advice in this book would certainly have helped many of the people I worked with who made terrible investing decisions, but not by much. This book is a product of its time when everyone and his dog thought they were stock-picking geniuses. After completing the bulk of this book review I realized that it is mostly critical, and this makes me uneasy because I’m a fan of Gail’s. I handle money well myself, but she has taught me a great deal about how to help friends and family who don’t handle money well. That said, I still think I need to warn people about many parts of this book. The main focus of this book is on stock picking. To her credit, Vaz-Oxlade recommends studying a company’s financials prior to buying its stock. Back during the tech boom I remember hearing things like “Do your own DD [due diligence], but Pets.com is going to the moon.” For most people, due diligence amounted to looking at a stock price chart, checking analyst ratings (almost all of which said “buy” or “strong buy”), and reading some online hype. But only a small minority of individual investors will really study a company’s financials. And even if they did, there is little hope that they would ever learn anything that the rest of the market doesn’t already know. The truth is that the vast majority of people should not have concentrated portfolios of individual stocks. The book advocates using “limit orders instead of market orders and using stop-loss orders, to protect yourself from market volatility.” Limit orders are a good idea, but stop-loss orders make little sense. If you really know that a company is a good investment, why sell when it gets cheaper? Stop-loss orders are mostly for gamblers. Vaz-Oxlade defines long-term savings as a time horizon of at least 7 years. Interestingly, she then says “Long-term money is money that’s bound for the stock market.” This probably makes sense for some people, but few mainstream commentators advocate a 100% stock allocation. To be fair, she may have changed her mind since then; almost everyone was bullish on stocks back in the tech boom. In a risk profiling test, the author says those who score the highest “could look at aggressive-growth stocks, start-up companies, commodities, options, and investment real estate.” Yikes. In a second, purportedly better risk profile test, I actually scored in the most conservative category. This is nonsense; the questions are just bad. One question asks “You’ve lost $500 at the track. How much are you willing to risk to get back your $500?” My supposedly conservative answer was zero because I know that race tracks offer bad bets, and I evaluate all bets on their merits and not based on how much I’ve already won or lost. Note that if the third category is at 50%, the minimum total allocation to the other categories is 60% for a total of 110%. In another model portfolio, if one asset is at its minimum, then using the maximum for all other assets only gives a total of only 95%. With this type of error, it’s hard to take these model portfolios seriously. In a discussion of blue-chip shares, it was funny to see GM included in the list. I’m guessing the investors who lost all their money in GM wouldn’t call it a blue chip. In general, people have way too much confidence in familiar stocks that have been around for a long time. Some excellent advice for the average investor is “make sure you’re diversified not only by asset type, but also by industry and region,” and “don’t buy on margin.” On the other hand, “check how your stocks are doing regularly—at least once a day” is not a good idea for most people. The author claims that managers of balanced funds have the ability to shift to fixed income during “declining market conditions,” and when “stock market conditions are strong, the fund will invest in more equities.” There is no evidence that fund managers as a group can successfully time markets this way. Vaz-Oxlade was ahead of her time in warning about the cost of currency exchanges. Back then return expectations were so unreasonably high that few worried about losing a percent here or there. My main goal of reading books is to learn something new. I had never heard of freeriding before. Normally you have 3 days to settle trades. Apparently, buying a stock and then selling it before the trade settles is considered freeriding and can get you in trouble. The author makes a mistake about the math of margin investing. If you have enough money for 1000 shares and use 50% margin, this means you can buy a total of 2000 shares, not 1500. “Options are also a relatively safe way to increase your exposure to risk.” The few people I know well who traded options lost all the money they traded with. The point the book tries to make is that a combination of 10% in call options and 90% in fixed income better protects you against losses than direct stock ownership. But this doesn’t matter much if the typical individual investor who trades options takes ridiculous risks. It was good to see the author use only 12% as an example average yearly return. It may be hard to believe today, but during the tech boom many investors believed that expecting 15% or 20% per year was conservative. The author advocates checking on your stocks’ earnings on a quarterly basis. “If a company’s growth or profits are disappointing—you can see this before they show up on the bottom line by doing your homework with the raw data—you can react and sell before the rest of the market catches on.” It’s ridiculous to think that you can sharpen a pencil and crunch some numbers before the worldwide army of professional investors does the same thing on their computers. Despite Vaz-Oxlade’s obvious skill at understanding people who overspend and helping them fix their financial lives, this skill does not appear to carry over to investing. Despite the fact that reading this book at the time it was written may have helped some people escape the worst of the mistakes they made during hi-tech bubble, I can’t recommend it to readers today. I have contacted both winners. Thanks to everyone who entered the draw! I appreciated that many of you took the time to add a note explaining what you like about my blog. It seems that the Friday “Short Takes” articles are more popular than I realized. Tony Robbins does a great job explaining the 9 most common investing myths. The first few are particularly well-written. These are some things I wish I had known in my youth. Larry Swedroe explains why alpha (the expectation of beating the market) is becoming more elusive. Rob Carrick has published his 16th annual ranking of online brokers. I’m glad to see that my choice of BMO InvestorLine is still high in the rankings. The Blunt Bean Counter gives some detailed instructions on how to properly do some tax-loss selling. He also discusses flow-through shares. This interests me because I’m having a good year financially, and looking at the total tax listed on my pay stub is painful. However, I’m not sure if it is too late for the 2014 tax year, and I’m not sure if I want more risk and complexity in my life. If I just procrastinate for another month, I’m sure to be too late and won’t have to think about this any more. The Reformed Broker reports that Jon Stewart now regrets having abused Jim Cramer. For those who missed it, Jon Stewart interviewed Jim Cramer on the Daily Show some time ago and ambushed Cramer with what amounted to an accusation that Cramer played a role in the 2008-2009 financial crisis. Of course, even if Cramer is innocent of this charge, he’s still guilty of encouraging ordinary people to become stock pickers and offers wildly overconfident advice on many individual stocks. My Own Advisor has a very good guest article about making good decisions that reduce risk and improve expected long-term returns. Chris Philips at Vanguard busts a myth about active investing outperforming in inefficient markets. Potato is pleased with the initial reviews of his new financial book The Value of Simple. Big Cajun Man wrote about the future possibility of TFSA retirement welfare bums amassing huge TFSAs but still collecting the Guaranteed Income Supplement (GIS). I wrote some time ago about possible changes to GIS rules to take TFSA assets into account. Million Dollar Journey updates some model portfolios with some new ETFs. Boomer and Echo considers whether investors are willing to pay for up-front advice. Scott Ronalds at Steadyhand uses an example case to illustrate some sound personal finance and investing advice. I don’t shop much. I like to say that there is only one shopping day left until Christmas because I’ll only shop one day. But my wife and I wandered into Future Shop recently, and I'm pleased to say that they saved me from an impulse purchase. As we entered, a young employee was hurrying by, but he took the time to pause and say “Hi guys! Welcome.” Despite the fact that I still find it sounds strange to hear a woman included among “guys,” the friendly gesture improved my already good mood. I then made an impulse decision to buy a piece of electronics whose price is about $100. Stepping quickly to find a cash, I found none had any cashiers. No problem, though, because there were a couple of desks on the other side with employees behind them. The first desk was the “customer service desk” where one customer with multiple receipts laid out was waiting for an employee seated on a chair facing the other way. The prospects didn’t look good. The second had a young guy tapping away at what looked like a cash register and talking on a phone. He politely directed me back to the customer service desk. With some residual good feelings about our greeting I proceeded to wait for a while with my new treasure and credit card in hand. It didn’t take too long for impatience to set in as neither the employee facing the other way nor the customer in front of me moved for a couple of minutes. I timed out and left. So, I offer my thanks to Future Shop for saving me from myself. I now have the chance to sleep on my decision to buy this item. If I decide to buy it anyway, though, I’ll probably go to a store a little quicker to take my money. Many good investing books advocate simple, index-based investing strategies. No doubt some readers are lulled into thinking that these strategies are just too simple. However, real-world complications find their way into even the simplest of strategies. John Robertson makes a strong case for investing simplicity in his new book, The Value of Simple. See the end of this review for instructions on entering a draw for 2 free copies of this book (one paper and one e-book). The main thing that separates this book from other investing books is that Robertson goes into detail for how to invest using each of three different financial institutions and types of funds: Tangerine funds, e-Series funds at TD Direct Investing, and Exchange-Traded Funds (ETFs) through Questrade. He judges these to be good trade-offs between cost and simplicity. He goes through the important practical steps of using each type of account using a few screen-shots. Most investing books back away from the details Robertson takes on. This is mainly because these details are untidy and make the whole topic of investing more complex. But this is a big part of Robertson’s point. You need to start with a simple strategy, because by the time you encounter the nitty-gritty of opening accounts and splitting your money across TFSAs, RRSPs, and other accounts, you’ll be glad you started off with a base strategy that is as simple as possible. Other topics covered in this book include the importance of keeping fees low, the power of compounding (explained using non-threatening bunnies), passive investing, risk and realistic return expectations, taxes, asset allocation, rebalancing, and much more. There’s not much to criticize in this book. In an example of the power of getting started early with investing, the author imagines someone who saves $10,000 per year for 35 years. Of course, this just isn’t realistic for most people. Most are able to save more later in life because of inflation and because their income rises faster than inflation. However, if shading the truth here helps to convince more young people to start saving early, perhaps it’s not such a bad thing. Overall, this book covers the topics a do-it-yourself investor needs to know and avoids the things they don’t need to know like how to pick individual stocks or how to time the market. I highly recommend this book to anyone who feels confused about how to invest. I also recommend it to anyone who thinks stock-picking and market timing are good ideas. Another benefit of going to my site when reading a post is to see the comments other readers leave on that post. All entries received before noon Eastern Time on Sunday, November 30th will be considered for the draw. I will make a random draw without favouring any particular entries. I reserve the right to eliminate entries that I judge to be outside the spirit of the contest. Good luck! The most common explanation of the value of diversification is avoiding big losses. Investing everything you owned in Nortel stock before the bankruptcy would have been a disaster. However, there is another side to the value of diversification. Josh Brown reported that many are blaming active fund managers’ failure to keep up with markets in 2014 on Apple’s success. Apparently, many fund managers owned proportionally less Apple stock than its percentage in the index. This failure to own high-flying shares is the other side of the benefits of diversification. In any given year, there are relatively few stocks that give huge gains. 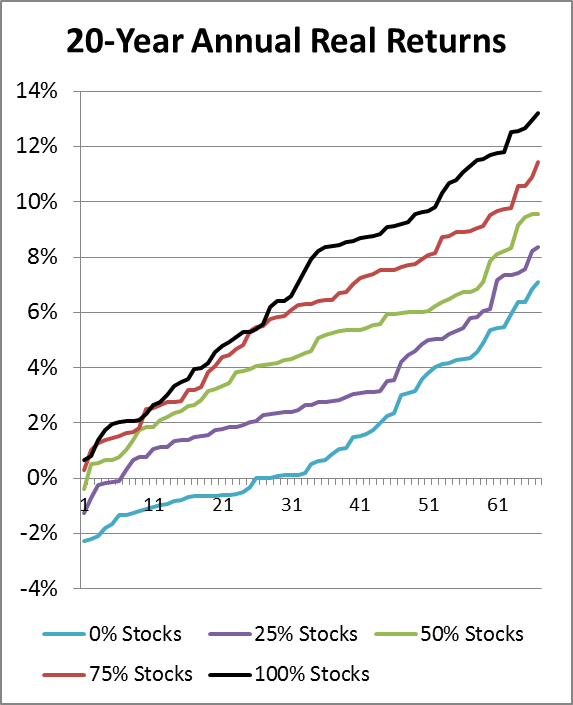 If you only own a few stocks and choose them essentially randomly, there is a good chance you’ll miss all the big winners. The advantage of an index is that it always gets it share of all stocks, including winners and losers. Keep in mind that a “winner” is a stock that performs better than the index, and a “loser” earns less than the index. There is an asymmetry that makes winners rarer than losers. Some winners more than double, particularly if you look at periods of longer than 1 year. But losers can only lose 100%. The net effect is there have to be fewer big winners than big losers. And among random concentrated portfolios, there will be some portfolios that win big because they happen to pick a stock that wins big. But there will be more random portfolios that lose to the index because they miss the big winning stocks. To maintain balance, the rarer winning portfolios tend to beat the index by more than the more common losing portfolios lose to the index. With this understanding, we see that fund managers moaning about missing out on big winning stocks is actually an expected result. With Apple having such a large market capitalization, the effect may be bigger this year than most, but it’s not all that unexpected. All that said, the other theme of Brown’s article, that Vanguard funds had a big year compared to other funds, is mainly due to the fact that Vanguard’s fees and trading expenses are much lower than those of other funds. But the fact that Vanguard’s index funds didn’t miss out on Apple stock helped as well. John Oliver (video) has a very funny and hard-hitting take on lotteries and the supposed good things they fund. NBC News reports that more than $10 billion of losses from Bernie Madoff’s Ponzi scheme have been recovered to be given back to victims who will get back nearly 60 cents of each invested dollar. This is somewhat misleading, though. Victims will get back a percentage of what they put in, not including returns. So, a long-time investor whose investments had tripled on paper would only be getting 20% of the amount on his phony statements. But this is certainly better than nothing. Jason Zweig reports on a study that found that individual forex traders lose an average of 3% per week. Remember this the next time you see a come-on for entering the supposedly profitable world of forex trading. A Wealth of Common Sense shows that the impressive back tests on the “Tony Robbins All Weather Portfolio” are mainly the result of the 30-year bull market in bonds. Million Dollar Journey takes a look at the subtle difference between using Norbert Gambit’s to exchange money from U.S. to Canadian dollars versus the other direction. Boomer and Echo asks whether banks should have a hand in promoting financial literacy. Another question: should cigarette companies have a hand in promoting quitting smoking? John Heinzl does a good job of explaining why spousal RRSPs can still be valuable even though retirees are permitted certain types of income-splitting. My Own Advisor explains that one of his motivations for managing his money well is that he doesn’t want to be part of the statistics of seniors carrying debt into their retirement years. The idea of “core and explore” investing is that you commit the bulk of your portfolio to a sensible “core” strategy, and use a small percentage to “explore” some of your own stock picks. Much has been written about the merits of this investing approach, but my thinking differs from what I’ve read before. As a starting point, it’s important to admit that for the vast majority of investors, the explore part of the portfolio will underperform a core index strategy over the long term. I won’t defend this assertion here, but if you reject it, then you won’t agree with much else I say. However, it’s not automatically true that core and explore is a bad idea just because the explore part of the portfolio is likely to underperform. One possible benefit of core and explore is that it allows an investor to scratch the itch to make stock picks with a small amount of money in the explore pot instead of making much bigger bets with the entire portfolio. In effect, allowing some exploring may be the only way for some investors to stick with a boring but solid plan with the bulk of their portfolios. Of course, adopting core and explore may harm some investors as well. It’s inevitable that an investor will make a couple of good (or lucky) picks in the smaller explore part of the portfolio. This could embolden the investor to begin making stock picks with the entire portfolio. In the end, whether or not core and explore is a good idea for a particular investor depends on that investor’s psychology. Given the choice between being 100% indexed and using core and explore, how would a particular investor fare with each? If the investor would execute the index strategy without fail, then it is very likely the better strategy. However, if the investor would constantly tinker with allocation percentages with pure indexing, but exploring with a small amount of money would prevent such tinkering, then core and explore is better. So far, I’ve only considered the investor’s expected returns as a measure of how to invest. But there are other considerations as well. For example, some people find it fun to pick stocks. Few really do any meaningful analysis, but it can be fun to channel your overconfidence and think you can just know that a company will do well. It can also be fun to talk about your picks with other people. This fun has some value. The problem is that it also has a cost in likely long-term portfolio underperformance. Few people are able to assess the expected underperformance of their stock-picking. One method is to assess the drag due to taking on uncompensated risk based on some model of stock returns. The math isn’t overly difficult but extremely few investors will estimate the cost and decide whether the fun justifies the cost. A complicating factor here is that most stock-pickers really do think they can pick above-average stocks. If this is really true, then there is no reason to stop stock picking. But we know that it isn’t true for the vast majority of investors. Some may think that if only 10% of a portfolio is allocated for exploring, then the most the investor can lose is 10%. This depends on what the investor does after losing some money on bad stock picks. Will the investor just live with an explore part of the portfolio that is only 5%, or will he or she replenish it back to 10%? With replenishing, the total losses over decades can be much more than just 10%. In the end, those who choose core and explore investing will do so for emotional reasons and will not know in advance how much money it is likely to cost them compared to pure index investing. But at least being 90% invested with a core plan beats being 0% invested with a core plan. Trying to maximize your after-tax retirement income is a complicated business. Cheerleaders for dividend investing are convinced that the dividend tax credit makes it a no-brainer that a dividend strategy is best to minimize taxes. However, as we’ll see, there are good strategies that use the 50% capital gains exemption as well. Dean owns dividend stocks that we’ll assume earn a 2% capital gain and 4% dividend each year. Dean’s dividend income is 4% of $1,232,000, or $49,280. This just happens to be the maximum he can earn and pay no taxes other than the $600 health premium. Carla earns the same total return of 6% each year, but she owns the exchange-traded fund HXT so that all her returns are capital gains. Obviously, her return will not be exactly 6% each year, but as we’ll see, her strategy is flexible. Carla’s plan is to withdraw the same annual income as Dean ($49,280), but she is going to split it between her RRSP and her non-registered account so that her total taxable income is $14,700. This is the level of income where she pays about $600 in taxes, the same as Dean. Carla’s withdrawals will be spread evenly through the year. Let’s assume that the average capital gain on her withdrawn capital during the first year is 3%. If Carla withdraws $35,091 from her non-registered account, this will be a $34,068 return of capital and a $1022 capital gain of which $511 is taxable. If she withdraws $14,189 from her RRSP, she will exactly hit her income target of $49,280 and her taxable income target of $14,700. In the second year, Carla will have more deferred capital gains and won’t be able to withdraw quite as much from her RRSP. Her RRSP withdrawals continue to decrease in future years as her non-registered account capital gains build up. There isn’t an obvious winner here. Carla has managed to use up some of her RRSP tax-free, but Dean has a smaller unrealized capital gain. Observe that Dean and Carla are now somewhat locked into their respective strategies because of the unrealized capital gains. Any change of strategy requires some selling that would lead to significant capital gains taxes. As Dean starts to draw OAS and possibly CPP, his tax situation changes; he will be paying income taxes on his dividends. Carla will pay some taxes as well but she has more flexibility in how much capital gain she chooses to realize. At the end of the year they turn 71, things change significantly again as they will both have to make mandatory RRIF withdrawals. Dean’s taxable income will rise to the point where he will pay significant taxes including a substantial OAS clawback. Carla’s taxes will rise too, but she will once again have more flexibility in how much capital gains she will realize. To make a complete comparison of Dean and Carla’s strategies, we’d have to make assumptions about CPP payments, desired income levels later in life, and how much of an inheritance they’d like to leave. I don’t see much point in doing this, mainly because the strategies so far have both of them living on less in their 60s than in their 70s, 80s, and beyond. It’s more realistic to devise strategies that aim for constant inflation-adjusted income with adjustments if portfolio returns disappoint. I’ve made a few attempts to devise tax-smart strategies based on targeting a constant after-tax real income for life (with adjustments if portfolio returns disappoint). I also included a safer risk level than Dean and Carla’s 100% stock allocation, and took into account TFSAs. Each time I work out the final result in an analysis that is more complex than the scenarios above, I find that capital gains strategies give slightly higher income than dividend strategies. While I’ve tried to optimize each strategy, I can’t guarantee that I’ve made the best possible choices to minimize taxes. So, I can’t say with any certainty whether dividend investing is better or worse for taxation, and it may depend on the specifics of account sizes and other factors. What I can say with some confidence is that those who focus solely on the dividend tax credit are missing the big picture.